Yesterday I posted an article on the pros and cons of memorizing prepositions (I lean toward con myself). A commenter asked for clarification when I mentioned that sometimes what look like prepositions are actually adverbs. So, I thought I’d provide a refresher on what exactly a preposition is and how you can tell one from a thinly disguised adverb. I understand confusion about prepositions. They are strange words. Useful to be sure, but hard to pin down. You can’t define them in the normal way. Try it for yourself: What’s the definition of with, of, from, on? Prepositions show relationship. They show how a noun or pronoun is related to another word or word group in a sentence. That’s an abstract explanation, I know, so let me try to show you what I mean. Gabby stuck her gum under the table. The project is due before Tuesday. Each of these simple sentences includes a preposition, which I have conveniently underlined for you. Each of them show how a noun is related to something else in the sentence. Under shows how the gum is related to the table in space. The relationship indicated is spatial. Most prepositions are like this — showing location in space. In the second sentence, before shows when the project is due in relation to Tuesday. The relationship here is chronological — time-oriented. The last one is the trickiest. Fortunately, the vast majority of prepositions are like the first two — showing spatial or chronological relationship. Of is the oddball, but it is a very common word. In fact of is second only to the in the list of most used words in English! Of is always a preposition and shows a sort of basic relationship that isn’t necessarily related to time or space. If something is of something, it is simply related to it in some way that makes sense to the reader. You can’t understand prepositions without understanding prepositional phrases because prepositions always form a prepositional phrase. Always. That’s important. If it has an object, it’s a preposition, if it doesn’t, it’s an adverb. Billy ran up the stairs. Billy looked up and saw the alien spacecraft. Both sentences include the word up. We know up is often a preposition, but let’s check. Does it have an object? In the first sentence it does: stairs. Up what? Up the stairs. H0w about the second sentence? Up what? Well, um, hmm. There’s no answer because there’s no object. Up in this example is being used as an adverb to modify the verb looked. It shows how or where Billy looked. Think you’ve got it? 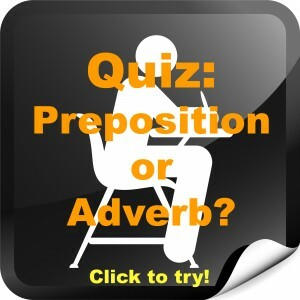 Click the link below and take the quiz I’ve created to see if you can tell when a common preposition is being used as an adverb. It’s free! ¹Okay, it’s not really as simple as that. There’s also something called a phrasal verb that includes what appears to be a preposition that is actually part of the verb–not an adverb, but part of the verb itself. For more about phrasal verbs, go here. According to the grammar books I have read prepositional phrases function as adjectives or adverbs e.g. But it seems to me they also function as nouns e.g. Under the bridge is very peaceful. Clearly the subject of the verb is “Under the bridge” and this is functioning as a noun since the subject of a sentence is always a substantive. Does this mean that “under” is not a preposition here but merely part of the noun phrase “Under the bridge” or would it be better to say the given prepositional phrase is functioning as a noun? I scrubbed under the boat. If one considers this a prepositional phrase then “under” would be a preposition governing the noun “boat” and showing the relation between “boat” and “scrubbed”. In that sense it would be adverbial. However this is quite different to saying “I danced under the bridge”, which is clearly a prepositional phrase functioning adverbially by telling where the action of the (intransitive) verb took place. I think it makes more sense to consider “under the boat” as a nominal phrase functioning as the direct object of scrubbed, much like: I scrubbed the table. This analysis seems more logical to me since “under the boat” clearly means the underside of the boat was scrubbed and that is as much of a direct object as a chair or table surely? I have also seen the example: I cleaned under the bed. I would be very interested to get your expert opinion. I will respond more thoroughly later, but I agree with you. A really very helpful elaboration with example. To assess my comprehension I opted for the quiz and scored 70% which again helped me to understand and clear my doubts. Thanks a lot for such an easy explanation. Thanks for your article it’s really usefull! I have a doubt, it’s kind of silly but I really don’t know because I’m just learning english, if you could help me it would be really helpfull. In 100% of the cases the object will always inmediately follows the preoposition? I mean it could be like this? Preposition + Object? I’m trying to understand how not to confuse myself. could you please explain how is ‘about ‘used as a preposition and as an adverb? when is that an adverb? What is “before” in that sentence? Can “you leave” be considered an object? Also, would it be the same for “before” in the sentence “They discussed a lot before writing a paper”? Thanks for your response. “You leave” cannot be an object. It is a clause because it contains a subject and a predicate. In your second sentence “They discussed a lot before writing a paper,” “before” is a preposition and the gerund phrase “writing a paper” is the object of the preposition. Thank you Brian. Nice explanation and very quick response. I would proffer that there is no real difference in linguistics and the distinction made is a synthetic and prescriptive one taken from Latin. Compare the rule of never ending a sentence with a preposition, which is a similarly pointless contrivance dreamt up by 17th century inkhorns. Proffer all you like, but my entire post offers only description, not prescription. I have explained the difference between a word used as a preposition and as an adverb. Feel free to argue that the difference is imagined. Whether it is taken from Latin or not is irrelevant. I don’t see the comparison you recommend. I have argued on this blog that the ban on terminal prepositions is nonsense. Do you have a point or do you just like to pick fights? Hey Brian, thanks for writing this article. Im still a little confused about something. 4) a sentence containing an object is always a prep. Your rule #4 is a little confusing for me. She turned on the light. (What is “on” here? Your first 3 rules suggest it to be an adverb. And I agree. But your 4th rule… “light” is an object is it not? So would that make “on” a prep? He picked me up. (What is “up”? First 3 rules make this an adverb. 4th rule make this a prep because of the object “me”. – please help me in your time of convenience! Well, your rules are not what I said. Preposition don’t describe space or time and “a sentence” cannot be a preposition, whether it has an object or not. But you bring up a good point. My rule about prepositions that don’t have objects always being adverbs isn’t actually true. There is also something called a phrasal verb in English that consists of a base verb and a particle (a preposition that doesn’t act like a preposition). Common phrasal verbs are: shut up, come across, join in, and get in on. These are compound verbs that require all parts to create their meaning. “Turn on” is one of those phrasal verbs. It has a different meaning from the word “turn.” It doesn’t mean to “turn” something in an “on” way. That would make it an adverb. The verb in your sentence is “turned on” and “light” is the object of the verb. 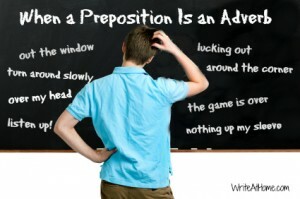 It’s not the object of a preposition (there is no preposition in your sentence). This is subtle and a bit complex. I hope what I’ve shared makes sense. Thanks for the question. He is clearly been around. Around is an adverb here. It indicates where he has been. It has no object, so it cannot be a preposition. Get it? I would like to know i thing, i found a sentence in a dictionary as a use of around as adverb & the sentence is ” she went around the office & got everyone to sign the card. ” I suppose ‘the office’ is an object. If so, it is contradictory to your explanation. Kindly help to advise. In your sentence, around is clearly a preposition. It introduces the prepositional phrase, around the office, with office as the object of the preposition. The whole phrase around the office functions like an adverb. Maybe that’s what the author meant. Please could you kindly explain the difference between the prepositional phrase and adverbial phrase ? Thank you. Sure, Chiat. A prepositional phrase is a phrase that starts with a preposition and ends with a noun or pronoun (the “object” of the preposition). These are very common in English. Some examples would be: in the air, on the table, around the corner, under the ocean, in space, up the ladder, in a split second, with my good friend, of many kinds, etc. Phrases that modify a noun or pronoun are called adjectival phrases (because adjectives are words that modify nouns or pronouns). A phrase that modifies a verb, an adjective, or an adverb are called adverbial phrases (because adverbs are words that modify verbs, adjectives or other adverbs). What can be confusing is that all prepositional phrases are also adverbial or adjectival phrases. Prepositional phrases always modify something–usually a noun or a verb. So, in the sentence, The bird flew over the house, “over the house” is a prepositional phrase because it starts with a preposition AND it’s an adverbial phrase because it modifies the verb flew. In the sentence, I see a man in a raincoat, “in a raincoat” is a prepositional phrase because it starts with a preposition AND it’s an adjectival phrase because it modifies the noun man. Can an adverbal prepositional phrase have the verb’s direct object within it as well. (So basically one phrase includes the verb’s adverb, a prepositional phrase, and the object of the verb and prepositional phrase all at the same time? Bread rises in a warm spot. Some spectators had sat below the bleachers. No. At least there is no way I can conceive of it. An adverbial prepositional phrase is a group of words that modifies a verb, adjective or other adverb. It will start with a preposition and end with the object of the preposition. That object cannot also serve as the object of a verb. It must be one or the other. Your example sentences don’t have direct objects. The verbs (rises and sat) are intransitive. “In a warm spot” modifies rises and “below the bleachers modifies had sat. Did I understand your question? After reading your article, I tried to figure out the differences between verb+ preposition and verb+ adverb. 1) Billy ran up the stairs. ( to run up = verb + preposition. It is a prepositional verb, and “the stair” is direct object) The prepositional verb does’t change the meaning of the original verb. That makes it differ from a phrasal verb. Ex: to give up = to abandon. He gave up his house. (to give up = transitive phrasal verb has a direct object (house) . That differs with Intransitive phrasal verb which never has an object. Ex: I go upstairs ( or I go downstairs) – upstairs and downstairs are adverb. 3. To become better; improve: Things are at last looking up. (my opinion: looking up = intransitive phrasal verb). You have an excellent grasp of the differences. My only minor correction has to do with your explanation of #1: Billy ran up the stairs. I’m not familiar with the idea of a “prepositional verb.” The verb in this sentence, as I see it, is “ran.” “Up the stairs” is an adverbial prepositional phrase. The phrase is prepositional because it begins with a preposition, and it is adverbial because the whole thing modifies the verb. Otherwise, you explain things well. You are correct. Above is a noun in that usage. Thanks. You are correct, John. We’ll fix that question. Some of these may be considered archaic though, but not all. All examples of which I am aware are of the form There, Where, or Here occurring in the first half and in, at, or on in the second half. If there are others, then I would be interested therein. Thank you so much for your clear explanation. It makes me more understand on this topic. However, I am still confused about “for” and “since”. Are they classified as “Adverb of time” or “Preposition of time”? I’ve already tried asking “what?” after the preposition. Then, every sentence found its object. Does this mean “for & since” is “Preposition of time”? e.g. – I have worked here since 2005. – They have been at the coffee shop for 4 hours. Since, on the other hand is commonly used as either as an adverb or a preposition (it can also function as a conjunction: I lost since Ed is a better player.) As I explain in this article, if since is followed by an object — if there is an answer to the question since what? — it is a preposition. If not — if it merely modifies a verb — it is an adverb. In your example — I have worked here since 2005 — since is a preposition (of time). Its object is the year 2005. But in a sentence like I haven’t seen him since, since is an adverb. So, the answer is that both for and since are prepositions of time — sometimes. But not always. Thanks again for your kind clarification. I hope I get the opportunity to take you up on that one day, Mai! Excellent explanation; very clear and to the point. Thanks Brian! To my surprise, she drank up the whole bottle of wine. Up is a particle here. A particle is a word that doesn’t fit into any of the eight parts of speech. Drink up is a phrasal verb — a verb formed by combining a verb with a preposition (though once it’s part of the phrasal verb it no longer functions like a preposition). Phrasal verbs are very common. The words work together to create a special idiomatic meaning that is different from what we’d mean if the particle (in this case up) worked like an adverb. When you drink up, you don’t drink in an up way or in an up direction. When you put drink and up together, it means something unique. Make sense? Read more about phrasal verbs here. but I still confused because I saw the essay on https://zh.scribd.com/doc/4007449/Multi-Word-Verbs. The author/s of that article consider the “preposition” part of a phrasal verb to be an adverb. I call it a particle because it doesn’t typically act like an adverb (or a preposition). But that’s fine. Grammars vary on these kinds of things. It doesn’t really matter. 1. Look up the chimney. 2. Open your eyes and look up! 3. Look up obsequious in the dictionary. All three sentences contain look up. In #1, up is a preposition that creates the prepositional phrase “up the chimney” which modifies the verb look. In #2, up is an adverb modifying look — it shows where to look. In #3, however, up is neither a preposition (no object, no phrase) nor an adverb. It does not modify look by indicating how or where to look. Look up is a phrasal verb with a unique meaning when talking about reference books. It makes sense to me to think of the up in #3 as performing a function different than the up in #2. That’s why I call it an adverb in #2 and a particle in #3. I’ve seen other texts that call it an adverb like in the article you linked to. But there are also others that do it my way. There are different ways of thinking about grammar that are all valid. I liked the way they divided “multi-word verbs” into three groups. I’m not sure how helpful that is, but I get it. I’d never seen that before. I’m not sure I understand your question, Leandrea, but I think you are correct. Over in “over the road” is a preposition, and over in “She ran over” is a adverb. Your explanations are very easy to understand.Thanks a lot.I am surely going to recommend your blog to my middle school students. Hi Brian. I am hoping you will be able to help me identify the part of speech “walk” is in the following sentence; We watched the students walk by. If you are interested, I can explain further. The simple subject of the sentence is we and the simple predicate (main verb) is watched. That part’s easy. The clause “the students walk by” is what we call a noun clause — a whole clause that functions together like a noun. It is what the we in the sentence watched. The clause functions identically to the word movie in the sentence We watched the movie. In other words, the clause “the students walk by” is the direct object of the verb watched. Now, clauses are word groups that have their own internal grammar too — they have a subject and predicate for example. In this noun clause, students is the subject and walk is the predicate (verb). By is an adverb here, modifying walk and showing how or where the walking happens. 1) what’s the difference between idioms and frasal verbs? 2) what’s the difference between prepositional frasal verbs and adverbial phrasl verbs? Glad to help. Let me get to your questions. 1) Phrasal verbs are a type of idiom. Not all idioms are phrasal verbs, but all phrasal verbs (as far as I know) are idioms. An idiom is simply a “way of saying” something in a given language that doesn’t translate well literally. A phrasal verb is a verb composed of a verb and a particle (a preposition that isn’t acting like a preposition or adverb). So, “give up” doesn’t mean to “give something” in an “up” direction. It means something else entirely (to surrender or stop trying). That’s what makes it an idiom. A word like “up” can be used as a preposition (The man climbed up the ladder.) Or it can be used as an adverb (Throw the ball up.) Or it can be a particle in a phrasal verb (I need to look up “particle” in the dictionary). I hope that helps. Maybe you could clarify what you mean by your second question. Perhaps I misunderstood it. To start off with, I want to say thanks a lot for your promptness to answer my questions. I really appreciate it. I guess I made you misunderstand my second question. I am sorry because it was my fault,.. What I meant was the following: I really don’t understand the difference between a prepositional verb and a phrasal verb. How about Adverbial phrases? How does it sound to you now? Probably, that’s the terminology I should have used before. As for my first question, It was really easy to understand your explanation.One more time thanks a lot for your kind help. I am not familiar with the term “prepositional verb.” Read the article I linked to below–it may help you understand how a word that is normally a preposition can be combined with a verb to form a phrasal verb. Maybe that will answer your question. I can help you with adverbial phrases though. 🙂 A phrase is a group of words that works together like a single part of speech. When that group of words functions like an adverb, it is called an adverbial phrase. For example. In the sentence, “Tom walks quickly” the adverb “quickly” modifies the verb “walks,” showing how Tom walks. You can use a phrase the same way: “Tom walks down the street.” In this sentence, “down the street” modifies “walks” the same way “quickly” did in the previous sentence. It shows how (or where) Tom walks. You might recognize “down the street” as a prepositional phrase. It’s that too. Any phrase that starts with a preposition (like “down”) and ends with the object of the preposition (like “street”) is known as a prepositional phrase. But all prepositional phrases ALSO function like adjectives or adverbs, so they are also either adjective phrases or adverb phrases. One more time thanks a bunch for your help. Sure, Lizzy. You’ve identified a topic I’m hoping to address soon on the blog–something called a phrasal verb. Some verbs in English are actually a combination of a verb and a particle (a word that doesn’t fit into normal part of speech categories). These particles typically resemble prepositions. These two words need each other to form the verb. In the first one, “up” is an adverb modifying the verb “look” (showing how to look). In the second, “look up” is a different verb altogether. The two words work together to create a particular meaning. This latter use is an example of a phrasal verb. “Pick up” in your sentence is an example of a phrasal verb. It’s not just “picking” something in the “up” direction :), “pick up” means something different. So, in this case, “up” is part of the phrasal verb “pick up.” Make sense? Other common phrasal verbs: give up, come over, blow up, call off, point out, turn down. Oh yeah, I did! Thank you so much! Nice explanation. But I have this sentence that really confuses me..
His new car drove over that large box in the street yesterday. What is “over”? Hi Benedict. “Over” is a preposition in your sentence. If you ask “over what?” The answer is “that large box.” So you have a prepositional phrase: “over that large box.” FYI, that phrase is also adverbial–it shows how/where the car drove.